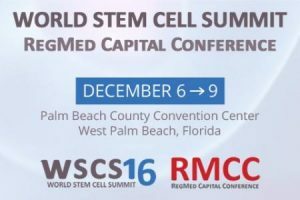 The Mayo Clinic Center for Regenerative Medicine will co-host the 2016 World Stem Cell Summit December 6-9 in West Palm Beach, FL. Organized by the Regenerative Medicine Foundation (RMF), the Summit forges collaborations to advance cell therapies, while creating a supportive environment of regulation, legislation, financing, reimbursement and patient advocacy. The Summit is the largest interdisciplinary stem cell meeting in the world, featuring more than 250 scientists, business leaders, investors, philanthropists, regulators, policy-makers, economic development officers, patient advocates and experts in law and ethics, presenting the latest scientific discoveries, commercial and innovation opportunities, legal and regulatory solutions, and best practices. During the summit, the Mayo Clinic Center for Regenerative Medicine will use social media to connect using the hashtag #WSCS16 . At the end of the week, we'll let the tweets, Google+ posts, Flickr photos, Facebook posts, Instagram, and YouTube videos tell the story. Follow the Mayo Clinic Center for Regenerative Medicine blog for updates, including a list of Mayo Clinic speakers, leading up to the event. Visit the 2016 World Stem Cell Summit website to learn more and to register. Click here to view highlights of Mayo Clinic at the 2014 summit.